The Forex Magnates' Tel-Aviv Meet-Up Is Here! Forex Magnates’ meet-up takes place tonight, and you can still reserve your table by mailing sales@forexmagnates.com, or just RSVP your attendance and show up for an early comers’ free drink. The Forex Magnates’ meet-up provides a unique opportunity to mingle, interact and get to know executives from all over the Forex industry, in the welcoming atmosphere of Tel-Aviv’s beachfront. 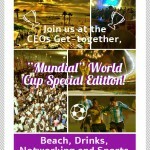 The event is scheduled for 20:00 PM (IDT) at ‘Gordo’ – a perfect venue located on Gordon beach. As the World Cup is gearing up to its peak, we will project the Germany Vs Brazil semi-final match on a huge screen. So get prepared for Forex Magnates’ Industry Get-Together!